Stephen Lille urges ruling junta to address democracy and human rights concerns in a speech in Washington. Thailand’s ruling junta is going against the tide of history and recent advances seen in Southeast Asia by overthrowing democracy and undermining rights, Britain’s top Asian diplomat told a forum in Washington, D.C. late last week. Compared to recent positive examples seen in Southeast Asia such as Indonesia’s democratization and Myanmar’s ongoing transition, Thailand, a democracy which witnessed a coup in May 2014 and troubling record on rights since by its ruling junta, sticks out as a rather negative one in the region, said Stephen Lillie, the Asia-Pacific director of the UK Foreign & Commonwealth Office. “If we talk about Burma moving forward as a positive example of democracy, or if we look an Indonesia and what’s been achieved in terms of democratization…Thailand is going against the tide of history and ASEAN,” Lillie, Britain’s former ambassador to the Philippines, said in response to a question from The Diplomat. The sanctions imposed by Britain as well as the European Union on Thailand following the 2014 coup, Lillie said, reflect the fact that they cannot approve of what has been done by the ruling junta to overthrow democracy and abuse human rights. While he stressed the importance of continuing to engage Thailand in the future instead of leaving the country isolated from the West, he said the onus was on the ruling junta to first take tangible steps to address the list of concerns expressed by the international community. “I think what we need to see from… the Thai junta is evidence of sincere and positive moves to respond to the concerns of Britain and the European Union and the United States,” Lillie said following an address at the Carnegie Endowment for International Peace, a Washington, D.C.-based think tank. 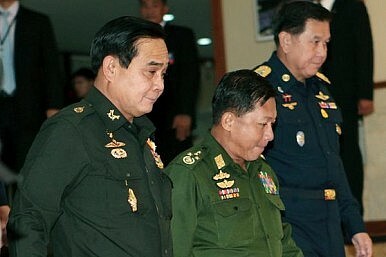 Those steps, he said, should move beyond addressing concerns about progress toward the restoration of democracy to include those related to human rights including trying civilians in military tribunals, subjecting critics to so-called attitude adjustment sessions, and using lese majeste laws to stifle dissent. He also urged Thailand to engage positively with other countries ahead of its forthcoming universal periodic review at the United Nations Human Rights Council in April-May. “There are things that Thailand can do that will create the conditions for greater engagement with the West. But the responsibility for the moment lies with the Thai,” Lillie said. One junta critic on the treatment he and his family are receiving under the ruling junta.